Washington Hall is a historic, community space and performance hall that is home to 206 Zulu, Hidmo and Voices Rising. Built in 1908 by the Danish Brotherhood, Washington Hall has anchored Seattle’s diverse Squire Park neighborhood in the Central District for over 100 years. The building has served as a hub for social and cultural activities for a broad ethnic community. In 1973, the Sons of Haiti, an African-American Masonic Lodge, purchased the building and continued the tradition of hosting performing arts, making it the first home of On the Boards. Historic Seattle acquired Washington Hall in 2009, saving it from demolition. 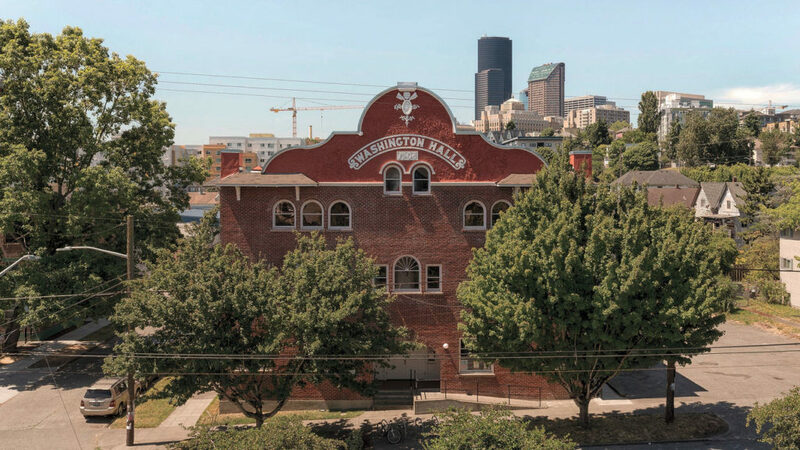 The renovation of Washington Hall is a Historic Seattle community development project that will help revitalize the neighborhood and makes the building available for public use. Duke Ellington, Billie Holiday, Jimi Hendrix, Mark Morris, Pat Graney, Bill T. Jones, David Byrne, Fugazi, Elvis Costello, Macklemore, and countless musicians, artists and great minds alike have walked these halls. est Theatre, continue to stage original works at the Hall. Washington Hall is a place to incubate and be reborn. Washington Hall is a project of Historic Seattle with major support from 4Culture. The Hall has consistently functioned as a performance space since its opening in 1908, but had fallen into disrepair in the last few decades and was in danger of demolition before Historic Seattle negotiated a purchase. The long term vision for the Hall is full rehabilitation and a permanent home for Central Area organizations with a focus on arts, media and social justice. Historic Seattle believes that buildings provide an essential link to the past, reminding us of who we are and where we came from. Founded in 1974, Historic Seattle is the only nonprofit membership organization dedicated to preserving Seattle and King County’s architectural legacy. Our mission is to educate, advocate and preserve. Learn more about Historic Seattle. An internationally recognized coalition that engages youth, low-income communities and people of color in social change through innovative programs involving hip hop music, arts and culture. Learn more about 206 Zulu. A network of artists, educators, and activists that nurture community and elevate the visibility of independent art, music, media and culture through all-ages programming, coalition building and leadership development. Learn more about Hidmo Cypher. Washington Hall offers two, versatile event spaces available for one-time or short term rental. The Ballroom (or Main Hall) on the second floor (with balcony) is a space that is perfect for larger public events, parties, and performances. The first floor Lodge Room is suitable for classes, meetings, lectures, and rehearsals. Both spaces have an open floor plan to allow for maximum flexibility. With a capacity of 735, this space is an ideal setting for public or private performances, music shows, parties, lectures, or could be used for larger music/dance classes, rehearsals or meetings. It features a stage, theater lighting system, and balcony. With a capacity of 300, this space is a charming option for smaller parties, meetings, rehearsals or dinners. The space can be rented alone, or in tandem with larger events in the Ballroom. To inquire about renting Washington Hall for your next event, meeting, class, or activity, please contact 206 Zulu’s Rental Manager at rentwashingtonhall@gmail.com. Any inquiries for the Lodge, kitchen or first floor areas, contact Hidmo Cypher at hidmocypher@gmail.com.